Author shares her musings and craft. Welcome to my blog. The main focus of this blog is to share my explorations into handmade goods, mostly of the needlework kind. 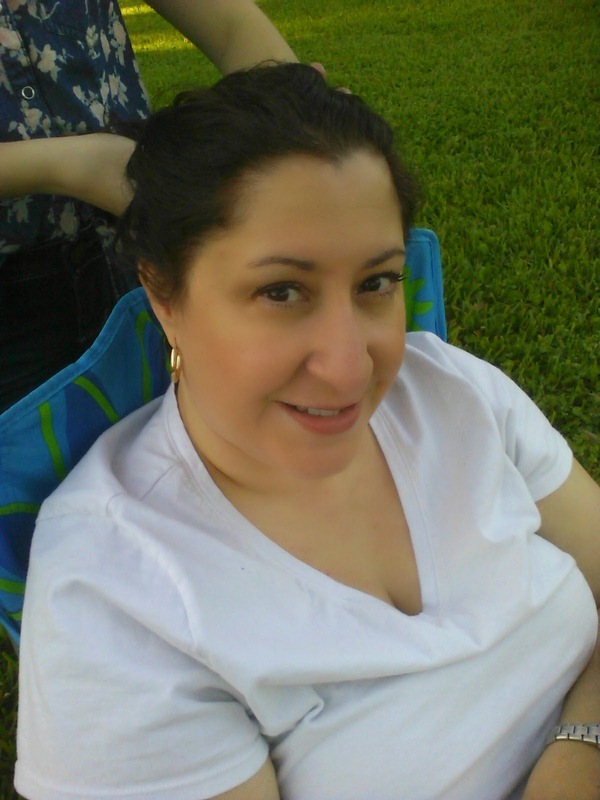 My interests are varied and include reading fantasy and urban paranormal romance, cross stitching and keeping hamsters. I must inform you that all of the pics and text on this blog are copyright protected unless otherwise stated and are not to be used in any other written or pictorial form without written permission from me. I give credit to the creator of the chart or the publication that published them in the caption. If you feel I have infringed on a copyright, please contact me ASAP. Whew..OK, now on to the fun...Thank you and Welcome. Wow, long time since I blogged last. Life's been pretty stressful and awful, but good too, in a weird way. So many things to be grateful for and so many things to be angry for. That's the way of it...flowing when needed, fighting the fight when needing, knowing when to do which is the key to a successful life. I do find myself fighting less and flowing more as I age...which makes raising teenagers really hard as all they want to do is FIGHT. God bless them. It took me an 20 minutes to access my blog...oh well. Nothing more to say at this time. I have to get back into the groove of blogging. 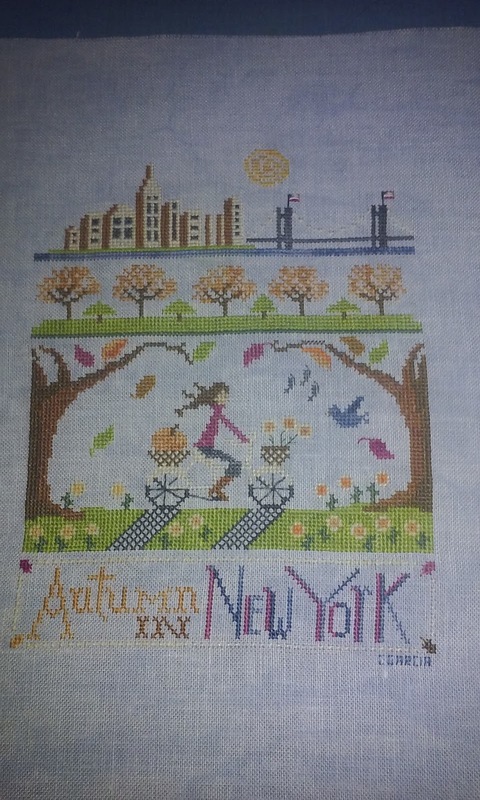 Hi, fellow stitchers, hoping everyone's needles are flying! Mine are not right now. Time has been spent shopping for school and running around trying to find a nice shelter dog to adopt. 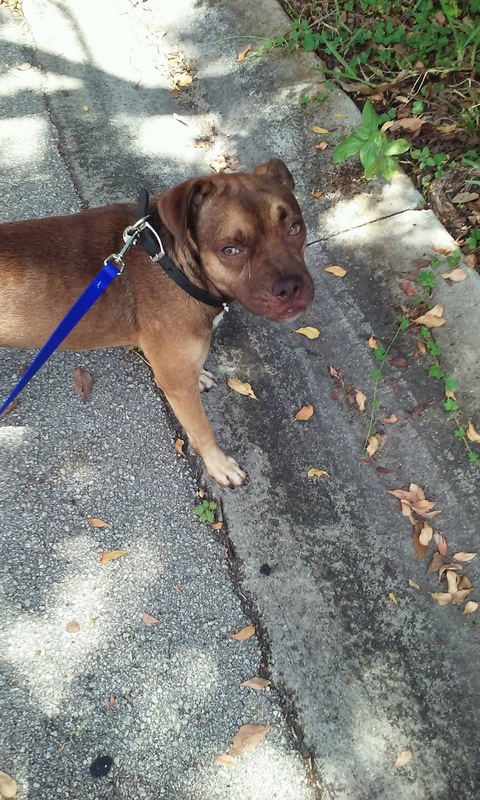 We got lucky this past Sunday and found this adorable beagle and Staffordshire Bull terrier mix. He is so sweet we love him already. I've been busy buying supplies and fixing up his crate. He is sick - kennel cough - and on antibiotics but otherwise he is fine. So, we now have hamsters, a cockatiel and now a dog. I am used to it because before the girls were born, I always had multiple animals. I remember one year we had a python, a greyhound, a rabbit, an iguana, a peach-fronted conure and two cats....aah, good times, good times. Here is a pic of Chester ( I call him Buddy Boy) on his first introduction to the neighborhood. Poor little mite is so cautious and scared. I can't wait to see his true personality shine thru but I hope he's not bonkers - I've had bonkers and it ain't no fun. 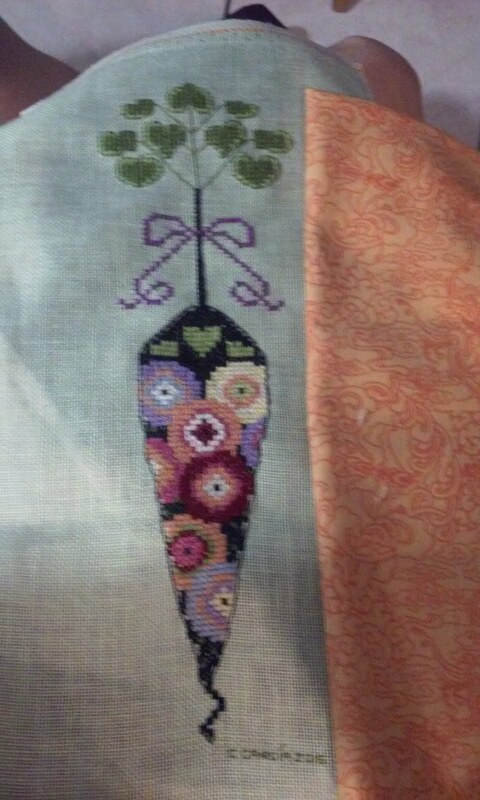 Now on to stitching. 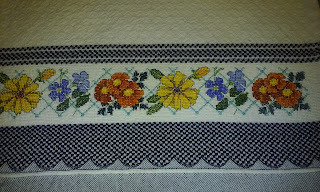 See below for my latest finish. I had actually left this behind in a hotel room and it was returned to me by the manager earlier this week, so I am very glad indeed. Autumn in New York by Primrose Needleworks, with some changes, of course. HI folks, Here are pics of a two finishes. School starts in a few weeks...and I am dreading it. Directly below is Cross Eyed Crickets 'Primrose Carrot' using called for DMC and Zweigart's Willow Green in 32 ct linen. Below is LizzieKate's Do Your Best Limited Edition cushion kit. Hope everyone is having a great summer...the kids are back to school soon..boohoo! Here is a pic of En Juin which I finished a few months ago. I am not sure what I am going to do with it. Hope everyone's summer is going well. 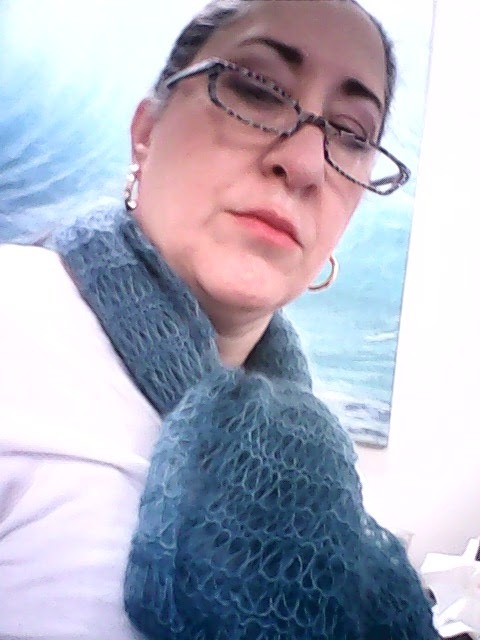 Greetings to all, Spring is here and in Florida that means that hot muggy days are back in full swing, yay!! Here is a pic of my latest finish. Peace Rose by Blackbird Designs. 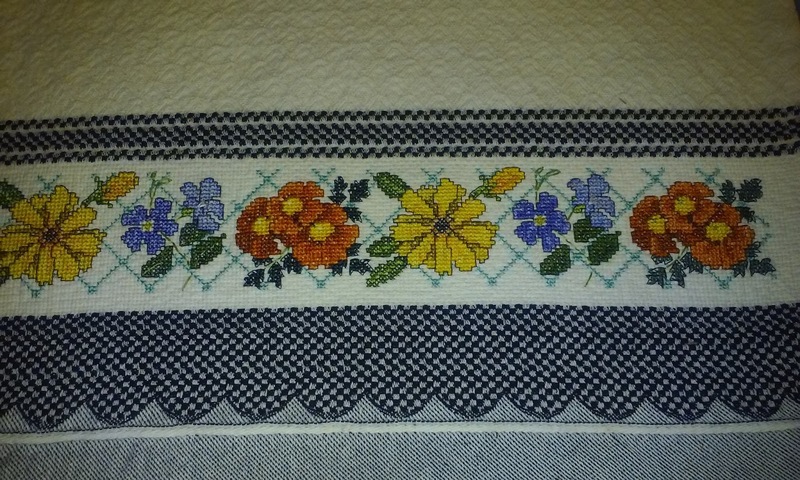 A sweet little stitch that made me happy. 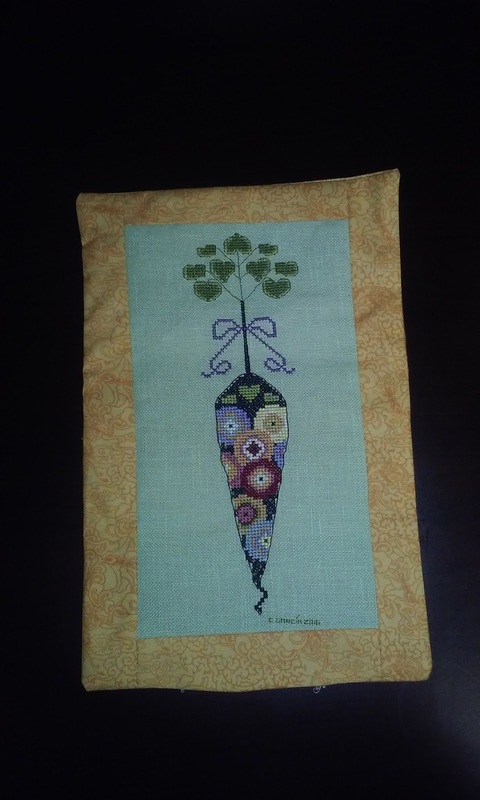 and here is a pic of my not-so-finished carrot, not sure of the design name but believe the designer is Cricket Collection. Someone correct me if not right, please. I was going to finish it with the orange fabric but might be getting some lavender fabric soon and instead would use that if the color is right. 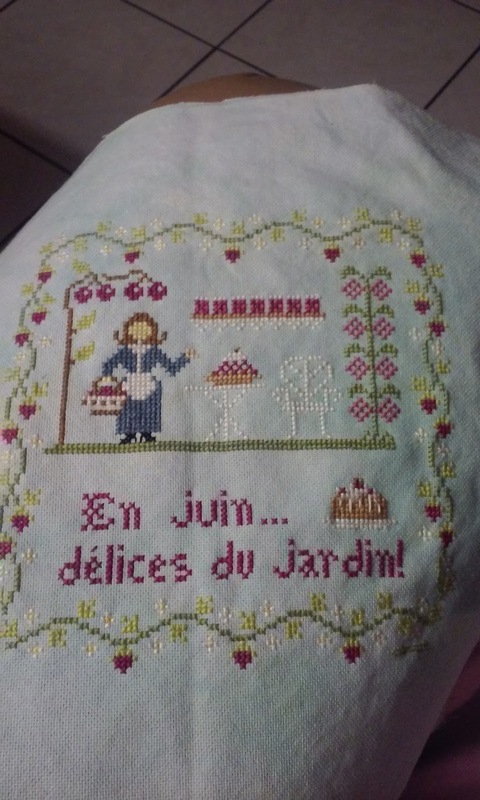 I have several WIPs to finish and so next on my list is "En Juin" which I started last summer but got distracted with spinning and knitting. Well, hope everyone is enjoying the arrival of spring and for those in the southern hemisphere, the arrival of autumn! Greetings to all. 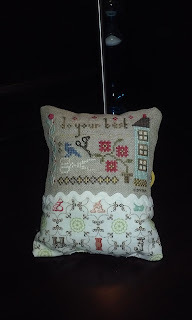 It's been hard to get back to cross stitching. It's one of many things that my sister and I shared that I am having a hard time getting back to. 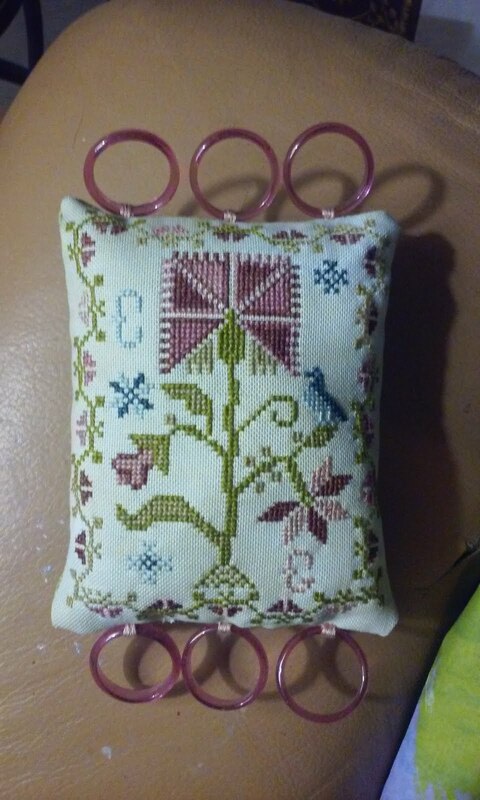 I tried stitching the other night and just managed to have a good cry...which is fine but I certainly hope this overwhelming sense of loss and confusion passes at some point. 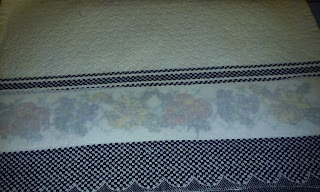 I have been spinning, knitting and crocheting so here are two pics. One is of me modeling a short scarf that I knitted using lace weight angora yarn...fun..NOT. It is very soft and snuggly. 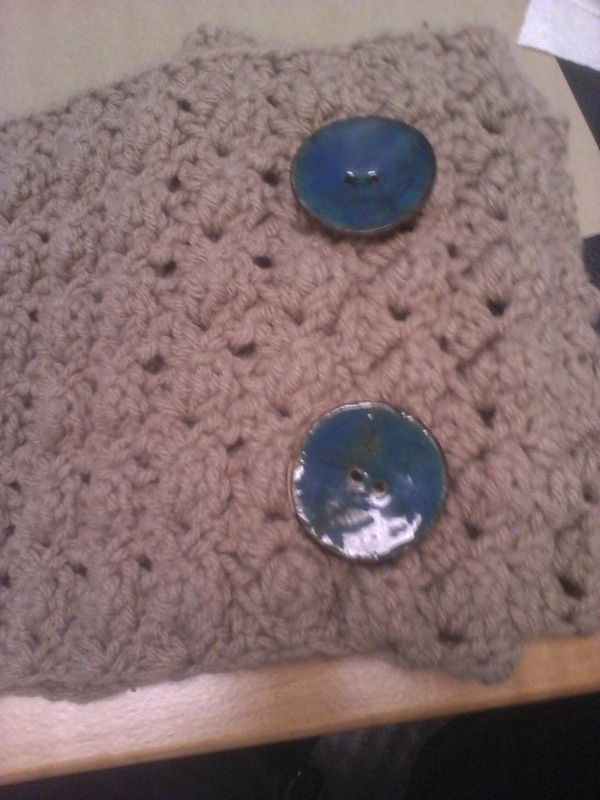 This other one is of a cowl that I made for my sister. I use it at the office where we like to keep it a toasty 68 degrees. 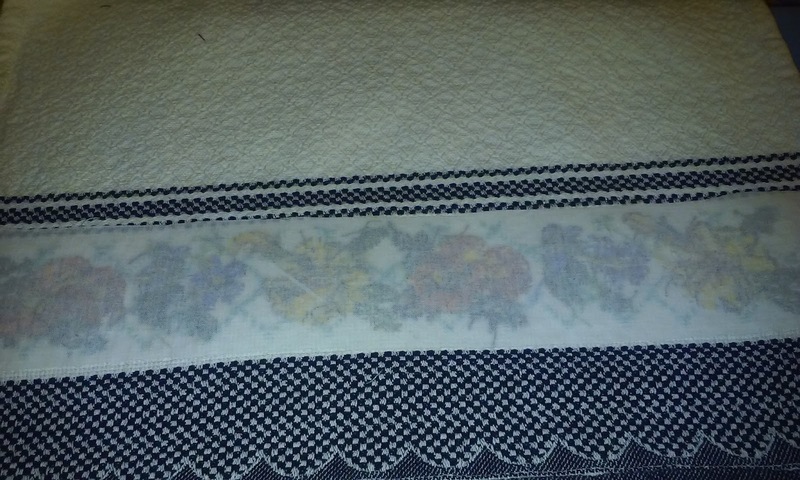 This one is crochet. Aren't those buttons cool? Yes, there is a blue green theme going on here. 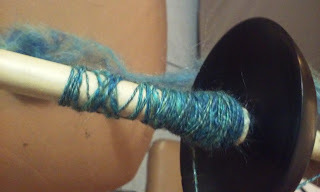 The fiber I am spinning now is similarly dyed. Below is a picture of the wool/bamboo/silk fiber that I am spinning on a new spindle that I just got..well, its a used spindle but new to me. On a side note, I just learned that Allessandra of Allesandra Adelaide Needleworks is in hospital with a diagnoses of myeloid leukemia. Her Facebook page has her address for any that wish to send cards. Fill your days with things and people you love. On Christmas Day, I found my sister in her house. She had died from apparent natural causes at least 7-10 days prior. She was only 47. I had had a horrible feeling about her and after unsuccessfully trying to reach her, decided to go down to see her. We had made plans to visit on the 26th but something bothered me. I have a very heavy heart as I feel that if I had gone down to see her when I first couldn't reach her, I could have saved her but that is something I will never know definitively, and maybe that is a good thing. I haven't done a memorial yet as I am having many problems processing this loss. She is my last living relative that cared about me and was near me. She was not just my sister but my friend and I feel her loss deeply. I can barely function at all. I'd like to ask that my family and I be kept in your prayers, and also, pray for her soul to rejoin God, or whatever way you define the "wellspring of all creation."